Adivasi villagers at Amvatikar have accused the CRPF of beating them and using them as shields as they were forced to search for security personnel’s bodies in the Katiya forest in Latehar district on January 8. Eleven security personnel were killed in an encounter with Maoists on January 7. Fifteen security personnel – four were yet to gain consciousness – were treated for bullet wounds at Apollo Hospital in Erba on the outskirts of Ranchi. Vijay Turi, a farmer from Amvatikar village in Latehar district was also being treated at the hospital for injuries in his eyes, on his face and hands. He is the only one among five villagers to have survived when an Improvised Explosive Device (IED) stitched into the abdomen of Baijnath Kisku of CRPF’S 112 Battalion went off on Tuesday when they tried to lift the body as part of the police’s search party. An IED, consisting of gelatin sticks, detonator and battery in a container, found inside the body of a second CRPF jawan from 112 Battalion, Babulal Patel, was defused on Thursday morning when doctors doing an autopsy in Ranchi had noticed fresh stitches on Mr. Patel’s abdomen and alerted the police. “There were 500-600 policemen all over the area. They came to our village on Tuesday morning and asked us for our help. They did not use any force against us, but it seemed there was no option but to go,” recounted Vijay Turi, speaking with difficulty through the bandages on his face. “Almost 100 of us, including many women and children, went as search party from my village and from Navadi village. In fact, there were more women than men. We took children because we thought we will be safe from the police doing anything to us if we take them with us. Ten of us at the front and got injured the most from the blast,” he said. “The policemen made us walk to the hill and then they held some men in the front by the back of their neck; they held a gun to Ganu, my niece’s son,” said Bimli Devi. Ganu (16) had walked a few steps up the Bhaluwahi hill and was bending over the jawan’s body when the blast took place. Only the lower half of his body was recovered on Tuesday evening. He was the youngest among the four villagers who died. ‘I found bones, and his scarf’ from Anumeha Yadav on Vimeo. Nawadih, Amvatikar, Chahal villages became the site of a confrontation between the security personnel and the PLGA in a chase that began near Gaya in Bihar on December 9, when companies of the PLGA’s military commission, led by their leader Arvind ji, started moving south of Gaya for Saranda forest in West Singhbhum in Jharkhand. Senior police officials supervising Operation Saamna say the CRPF intercepted the PLGA on Jharkhand’s border with Bengal and Odisha. The PLGA then headed north-west to reach Latehar in early January. When the CRPF and the PLGA started exchanging fire a few 100 metres from Amvatikar in the morning on January 7, most villagers were at the bal samagam, where hockey matches and races were organised at the government school in Nawadih for children. “We heard shots all day. Next day, Pramod Sau from our village said I would have to bring my tractor to the police to carry bodies from Nawadih to Heregerha station. Some villagers were asked to sprinkle water on the school playground so that a helicopter could land there, other villagers, including women, were asked to walk to the forest to search for the jawans’ bodies,” said Mithilesh Sau. Five hours later, a blast occurred when villagers tried to lift a jawan’s body, killing four. 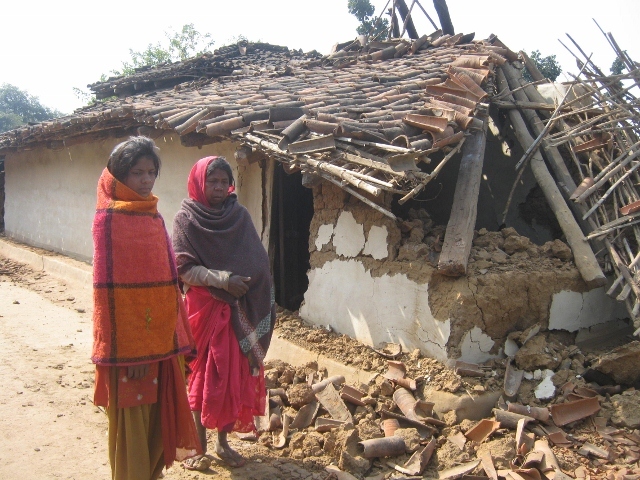 “After that, the CRPF men abused me and asked me to look for the villagers’ bodies. I was scared to climb the hill. I spotted Pramod Sau lying with his face bleeding and carried him back,” he added. In a handwritten note signed by Bihar Jharkhand North Chhattisgarh Special Area Military Mission spokesperson Toofan, Maoists said they had sewn a time-bomb inside the trooper’s body to maximize casualty among security forces. The report from the the hospital in The Hindu. Detailed report from Amvatikar and Nawadih in which villagers alleged they were used as human shields here. Villagers were unable to resume their lives and work days after the encounter. A later, 24 Jan report here.